To start the school year off on the right foot, sixth graders did a Visible Thinking Routine about the rules in our Library. Since 6th graders have heard the specific rules for book checkout and appropriate behavior in the Library many times over the years, I wanted to move it up a notch this year and have them think about how to act in the Library using higher level thinking skills. To start out, I had a slide from a Keynote on the screen. Their direction was to take a few minutes and look at the slide and then we would discuss what they saw. Not what it meant (yet) but what they saw, paying close attention to the details. No right or wrong answers here. The interesting thing for me as a teacher was how this settled down the students. In our world today we are literally bombarded with visual images and it takes skill and focus to slow down and pay attention to details. The first slide was a child’s drawing that represented culture. After observing, students offered their contributions on what they saw. The next slide I projected was the same one with the words, “How does this drawing illustrate what a culture is?” Students offered their opinions but this time they were told to back up their opinion with details from their observations. It was quite a lively discussion. 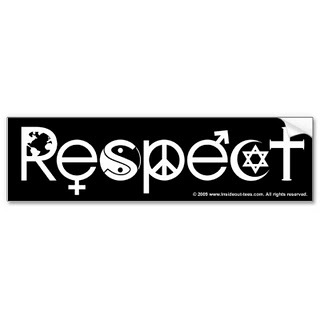 I proceeded with a slide of a bumper sticker (see above) illustrating the word “respect.” The last slide was an illustration of empathy and their final discussion centered on how empathy is connected to respect. With the discussion done, they went to 3 tables and brainstormed on large sheets of white paper about how one could demonstrate a culture of respect in the Library in relation to books, equipment and computers, and people. This is a Visible Thinking Routine known as Chalk Talk. At the end each group came up with a Headline (another Visible Think Routine) for the main idea for their page. As a teacher of 40 years, I was thrilled to try out these new ideas and apply them to what would have been a somewhat boring but necessary part of the first week of school. Students were highly engaged and as well as learning strategies to improve their thinking skills–something they can apply to all parts of their learning life. A great start to this new school year! I’m looking forward to integrating these methods into all my classes. Kindergarten–Learning how to act in the Library takes a little practice and a little instruction but it was made much more fun with Carrie Finn’s book Manners In the Library. After we read the story, students had time to browse the shelves and check out a book to take home. First Grade–Taking care of library books is an important lesson and first graders enjoyed Toni Buzzeo’s Penelope Popper, Book Doctor. This charming new picture book tells the story of a little girl who dreams of becoming a doctor and in doing so annoys all her friends by asking to check their blood pressure, or listen to their hearts. While in the library one day, reading books about doctors, the librarian shows her that even books need “doctoring” sometime and then shows her several ways books can become damaged. Penelope rises to the occasion and become the expert on book repair, much to the admiration of her previously annoyed friends. This a a great book to introduce children to the importance of caring for our library books. Third Grade–Choosing just the right book can sometimes be a challenge, especially with so many choices. Third graders heard the story of Goldie Socks and the Three Libearians by Jackie Mims Hopkins. This funny take on the classic fairy tale was a great way to help students learn to use the five finger rule when they look at a book. When they read a few pages, they keep track of the number of words they don’t know by putting up a finger for each one. If they get 4 or 5 fingers up, then they know the book might be too hard. Bookmarks that illustrate this were given out, too. I saw a lot of fingers being used and a lot of “just right” books got checked out! Fourth Grade–To introduce students to the Dewey Decimal system, I showed them a humorous Keynote presentation called Mr. Dewey and the Alien. Then they had a chance to find books from our collection in certain Dewey classifications. After checking books out and reading silently, we finished our time with Dewey: There’s a Cat in the Library by Vicki Myron. It’s the real story of a kitten who was put in the book drop of a public library in Iowa and became the library’s mascot. Fifth Grade-Speed Dating for Books? Well, I thought I’d give it a try. We have a wonderful selection of new fiction for upper graders and my dilemma was how to show those books in a short amount of time. So I set several books on each of 3 tables. After we had a discussion about how to look at a book–from the cover, to the jacket flap summary, to reading the first several pages–students were broken up into three groups. They had 5 minutes at each table getting to know the books, using the ideas we had just discussed. After 5 minutes they switched tables. We did this 3 times. I’m happy to say that many left the library with the intent of starting a great relationship with one of the new books!